Feel Better Naturally! Experience powerful Pranic Healing treatments. All pranic healing sessions are performed by an experienced professional Certified Pranic Healer and Instructor, Cetified Pranic Psychotherapist, an authorized personally trained student of Grand Master Choa Kok Sui. Pranic Healing is our profession. All we do for living is Pranic Healing. That's why we are serious about it, committed to solving your problems and good at producing results! We are not medical doctors. We do not touch physical body and do not make any medical claims. We work on the etheric energy body of a person by removing the areas of congestion and supplementing the areas of depletion. When energy body and energy centers are clean and energized, pranic energy flows smoothly and distributes evenly. That results in the increased ability of the physical body to mobilize the protective forces and expedite the natural innate ability to heal itself. If an etheric energy body is balanced, the physical and emotional processes tend to follow the trend. An experienced Pranic Healer can greatly influence this process. 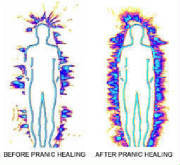 WHAT CAN BE HEALED BY PRANIC HEALING? Although we intelligently facilitate this process, it is actually your own body that heals itself. In our practice, we have seen a wide variety of ailments substantially relieved or completely remediated. Call us to discuss your issue. Each person is different and responds differently to different things. We offer a single session for you to try. If you like it, the packages of multiple sessions are available at a discounted rate. You know the benefits of organic food, physical and oral hygiene but often neglect the hygiene of your energy system. This is your chance to treat yourself to this energy hygiene delight and receive a complete energetic shower. Purify yourself, flush old, dirty and used-up prana, remove old trends, cut negative connections that drain your energy, clean your aura, receive chakra cleansing and balancing. Then indulge yourself in the waterfall of fresh and revitalizing energy. Sharpen your mind, activate mental faculties, ability to focus and stay alert, improve creativity, clarity of thinking. Feel more alive and energized. Recomended for the graduates of Kriyashakti course! This is our materialization service. We will help you to super-charge your wish and remove obstacles on your path to your goals. The service is performed in a non-injurious and loving way to everyone involved. We will help you to manifest what you are entitled to but had difficulties to attract. This service may be combined with other sessions. Is your house is an un-happy place? Do you feel drained? Are there dark thought forms and depressive emotions? We will clean your house or office, the land around it nd restore the normal flow of energy so peace, joy and prosperity can settle there. This session will help you to develop strength and increase your overall energy level, achieve alertness and vitality. Feel more awake and energized. Thorough Pranic Healing treatments allow to substantially reduce the time required for injuries to heal or recover after the surgery. Shorten the time on the bench and reduce the use of pain killers. Among variety of gastro-intestinal dysfunctions, persistent constipation can be remarkably relieved by the application of pranic energy healing sessions. Sooth your pain and get back into the comfort zone. This is our popular pain relief service. Relieve headache, back, muscle and joint pain, Powerful and effective! - call us to discuss your particular issues. A two-hour thorough pranic treatment to remove unnecessary, unauthorized, negative and draining energetic connections with other people or past events. Release old deeply seated attachments that sabotage your happiness and success. Disconnect cords to your previous relationships and traumas. Get healed from the past. Move on with your life. Pranic Healing is not intended to replace traditional medicine but rather complement it. If symptoms persist, please consult your medical doctor and a certified pranic healer. We respect your time. Please respect ours. There is a $75 charge for no-show. All package sessions must be used within 6 months from the date of the purchase. No refunds will be given.